According to Father Abram Fahmy, pastor of St. Simon the Tanner Monastery in Mokatam Hills, on the outskirts of Cairo, Copts were killed and injured today in a fresh attack by Muslims. 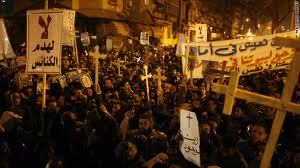 It was reported the Egyptian army fired live ammunition on Copts. The attack has claimed until now the lives of 9 Copts and injured 150, 45 seriously. 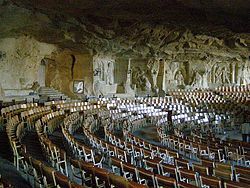 St. Simon the Tanner Church is a series of caves containing seven churches and chapels of the Monastery of St. Simon the Tanner. Carved directly from the rock, the Coptic Christian churches are a unique example of the faith and dedication of the zabaleen people. 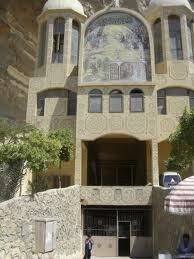 The church(es) are tucked away in the Muqattam Hills. Muslims threw fire balls at the Monastery from the top of the hills. Coptic youth have arrested five of them, who are now being held within the Monastery grounds, waiting to be handed over to the authorities. Eight homes and 20 garbage recycling factories owned by Copts have been torched, as well as 30 garbage collection vehicles. The incident started when 500 Coptic demonstrators from Manshier Nasr, which is near the Monastery, were on their way to join the Coptic protest near the Egyptian TV Building, to show their solidarity with the Copts of the village of Soul in Atfif, who were forcibly displaced from their village and their church torched. Nearly 15,000 Muslims from the nearby area of Sayeda Aisha and Mokattam, who were armed with weapons including automatic guns, confronted the Copts. The clashes first started with hurling of stones at the Coptic demonstrators, then Molotov Cocktails. According to eyewitnesses the Copts called the army which arrived at the scene at 15:00 (3:00 PM Egyptian time) with 10 tanks . At first the military stood by watching, then shot in the air, then at the Coptic side with live ammunition. There was a media blackout on the incident. There are no reports of any Muslim casualties. SO MUCH FOR THE OFTEN REPEATED CLAIM THAT THE EYPTIAN MILITARY CAN PREVENT THE FUNDAMENTALISTS FROM TAKING CONTROL OF EGYPT. AS THE SMALL NUMBER OF SECULAR LEFTISTS IN EGYPT IS SWEPT OUT OF THE WAY BY THEIR MASTERS, THE MUSLIM BROTHERHOOD, EGYPT PLUNGES FULL SPEED AHEAD INTO A REINCARNATION AS A FUNDAMENTALIST ISLAMIC STATE.